with widespread moderate to poor overnight humidity recovery. Warning, which is in effect from 11 AM Friday to 5 AM PDT Sunday. * WIND...North wind 10 to 20 mph with gusts to 35 mph. * HUMIDITY...Afternoon minimum humidities as low as 10 percent. Overnight recoveries as low as 20 to 35 percent. 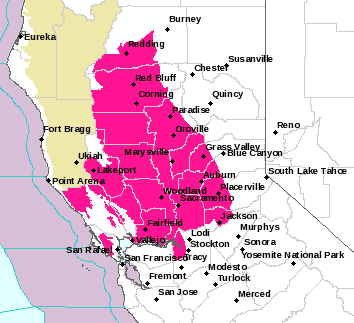 * IMPACTS...Any fires that develop will likely spread rapidly. elevations of Napa County and far eastern Sonoma County. * WIND...Northerly winds of 15 to 30 mph with gusts to 40 mph.